Just a quick post before a busy weekend ahead. 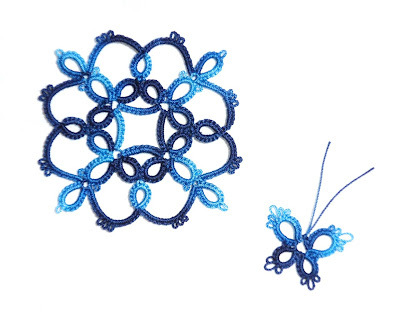 Thank you to Evelyne of Le Blog de Charlette for enabling me to discover some new patterns. They are designed by Jennifer Williams and her blog is called Cariad Tatting. She has quite a few free pretty patterns there so do go check them out. This is the first one I tried but I will be making a couple more. Next to it is the small butterfly I modified from Handy Hands' pattern. This is not a difficult pattern but I think it has an appealing shape. The thread which I have had for a little while but never used is from Jess at Tat-ilicious. I don't think it had a name (maybe Jess can put me right on that). Lovely little motif... thanks for the link to Jennifer Williams’s patterns - very good one! pretty motif and thanks for the patterns. Love the motif and thank you for sharing the link to the patterns!! I have never seen her site and love some of the patterns there!! i love her patterns, i just did one yesterday...5+5=10. it covers a sequin, simple, but fabulous. i tried one of her celtic picot patterns...i did not fair as well as she did. lovely motif. thanks for sharing about the pattern site. Beautiful motif, I love your works! Wonderful Fan... and I'm a Fan!